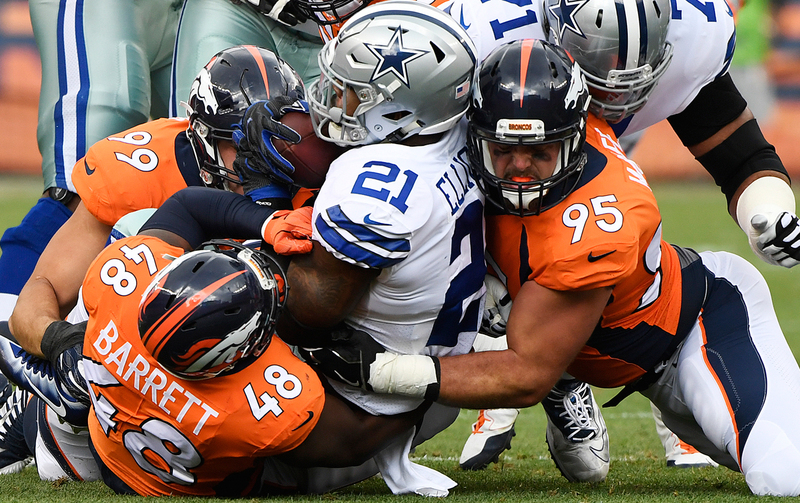 The Broncos defense bottled up Ezekiel Elliott, whose eight-yard rushing performance was his career worst. I don’t like what Ezekiel Elliott did Sunday. At all. With the Cowboys down 18 to Denver in the middle of the third quarter, Elliott, the defending NFL rushing champion, ran a route from the left slot. Quarterback Dak Prescott threw for the receiver just outside Elliott to the left, Dez Bryant; the ball went through Bryant’s hands, and Denver’s Chris Harris intercepted it. At the time of the interception, Harris was about five yards away from Elliott. Elliott immediately stopped and put his hands on his hips and didn’t chase Harris. Harris ran to his left, passing maybe four yards from Elliott at their closest point. Eventually, in a zig-zag course, Harris ran back to his right and was tackled by a Dallas lineman. I give you the play-by-play to describe without prejudice exactly what happened on an important play in the eventual Denver rout of Dallas. Elliott stopped. Elliott did not chase the Denver interceptor, though he certainly would be instructed by any coach in the history of football to pursue the man who intercepted the ball until he was down. Elliott stood there with his hands on his hips. He did nothing. It was a stunning lack of effort in the middle of a game that was still certainly in play. Dallas, down 28-10 at the time of the Harris interception, had six possessions after that. So often in cases like this, the player gets a pass. And very often, Dallas players get passes, because the Cowboys take chances on great players who have character or behavior or ethos flaws. Elliott might have all three of those. To give up on that play was horrendous. Dallas coach Jason Garrett has to do something about it—if he has not already. Owner Jerry Jones should back his coach 100 percent when Garrett does discipline Elliott. And if Garrett does not, then there’s something seriously wrong in Dallas. It’s one thing to be frustrated. It’s another thing to quit. Elliott is a good football player who quit on a play. Don’t sugarcoat it. He quit on a play in the middle of a game that was still a game. And he should not be allowed to get away with it. Maybe Elliott was frustrated at his awful day (nine carries, eight yards). Maybe the pressure of his suspension and his court case to try to overturn the suspension are getting to him. Maybe he simply doesn’t handle failure or rejection well. The 42-17 loss to Denver was an eye-opener for Cowboys players and coaches and owner Jerry Jones. But that changes nothing about what we saw in the middle of the third quarter, with the game slipping away, and one of the best players on the team giving up on a play he could have tried to make. Inexcusable.